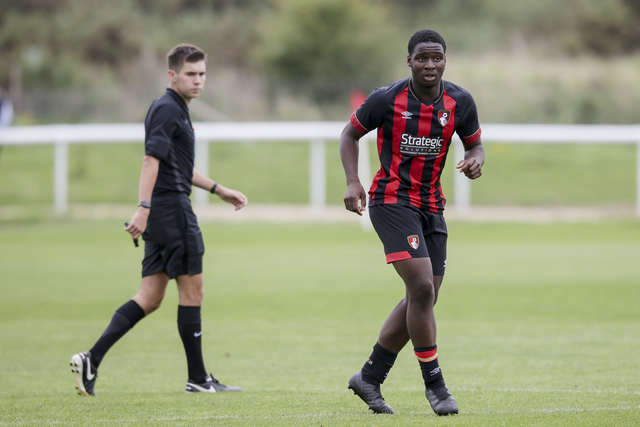 AFC Bournemouth Under-18s were held to a 2-2 draw away Swindon Town on Saturday. The Cherries responded to a second-half setback with two goals in quick succession, with strikes from Christian Saydee and Jake Cope putting the young Cherries ahead before a late Swindon strike meant the points were shared. “We started the game well but Swindon made it difficult for us to play out from the back. Credit to our boys, we kept trying to find those short, sharp passes. “We had our strikers stretching the game as well so we tried to utilise our strengths and make it difficult for Swindon. I think we did that but were a little bit wasteful in the final third. Our finishing wasn’t what I would expect. “It was 0-0 at half-time after having most of the ball but not doing enough with it in the final third. We started the second half quite well but conceded from a corner which was disappointing. “Credit to the boys because we equalised quite soon after through an excellent Christian Saydee goal. He picked up the ball, dispossessing a Swindon player in the centre circle and running half the length of the pitch before finishing in the bottom corner. That was great to see from him. “From the kick-off, we pressed really high and managed to steal the ball in their defensive third and Jake Cope finished really well after exchanging passes with Saydee. Scoring two goals in a minute was a massive lift for us and shows the spirit the boys are playing with at the moment. “We had chances to get the killer goal and their goalkeeper made a few good saves. We were definitely more clinical in the final third in the second half which is pleasing but ultimately we conceded late on through a goal which, having watched it back, was a couple of yards offside but unfortunately it was given.